Whether you heard it watching Law & Order or Breaking Bad, or read about it in a John Grisham book, people in real life and in fiction toss the phrase “attorney-client privilege” around now and then and the user may not fully understand what it means. 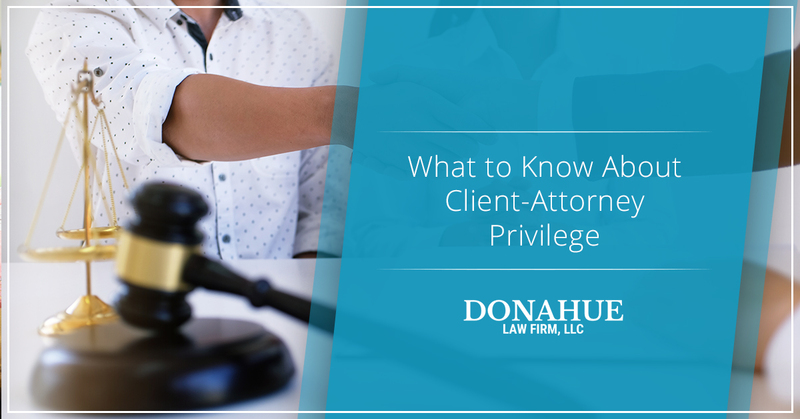 In this post, we’ll be discussing what attorney-client privilege means, when it’s applied, and more. At Donahue Law Firm, we take the law seriously and we are passionate about aggressively fighting each case to ensure our client’s rights are met. From our initial consultation, you can be confident that we will treat your case with respect and that you can put your full trust in our experience and knowledge. We realize that it can be intimidating telling a criminal defense attorney, someone who is essentially a stranger, the details and specifics of your situation, but the more open and honest you are about your case, the better we will be able to represent you in court. Our criminal lawyers have experience with a variety of court cases, including DUIs, drug charges, domestic violence, fraud, violation of restraining orders, and more. Don’t hesitate to reach out to us when you need legal advice or assistance. Essentially, this ensures that all communication between a client and their lawyer remains confidential. An attorney is unable to disclose their client’s secrets or other details of a case. This allows defendants to openly communicate with their lawyer. 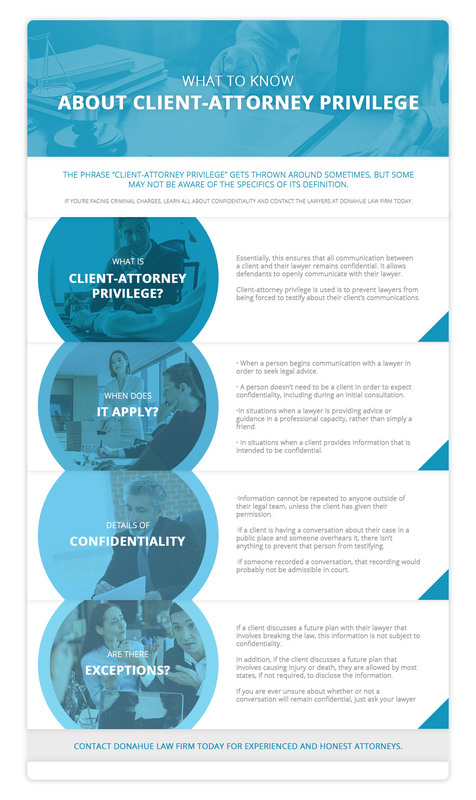 The client-attorney privilege applies when a person begins communication with a lawyer in order to seek legal advice, whether they are an actual client or not. It applies to situations when a lawyer is providing advice or guidance in a professional capacity, rather than simply a friend. It also applies in situations when a client provides information that is intended to be confidential. Any information that is provided either verbally or written (letters, emails, etc.) to a lawyer that is intended to remain confidential cannot be disclosed. The information cannot be repeated to anyone outside of their legal team, unless the client has given their permission. Confidentiality is a privilege that belongs to the client, not to their criminal defense attorney. This privilege never expires, even after the client dies, unless there is an exception (more on this below). One of the reasons why the client-attorney privilege is used is to prevent lawyers from being forced to testify about their client’s communications. In addition, attorneys have a duty to avoid informally talking about anything that involves their client’s case with anyone outside of their legal team. This also includes information about the case that was received but didn’t come from the client themselves. Clients can expect confidentiality from their lawyer in a majority of situations, but only if the circumstances allow for it. For instance, if a client is having a conversation about their case in a public place and someone overhears it, there isn’t anything to prevent that person from testifying. Similarly, if someone recorded a conversation, that recording would probably not be admissible in court. If a client repeats a conversation they had with their lawyer with someone else, that conversation will not be held to the same client-attorney privilege standard. A person does not need to hire or sign a contract with an attorney before the client-attorney privilege applies. Conversations that reveal criminal or unlawful actions during a preliminary meeting will remain confidential even if the potential law firm never actually represents the client. Past actions are typically subject to the client-attorney privilege. However, if a client discusses a future plan with their lawyer that involves breaking the law, this information is not subject to confidentiality. 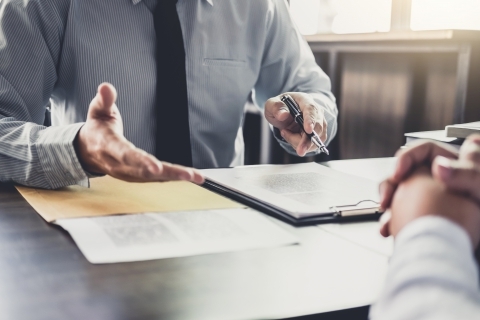 In addition, if the client discusses a future plan that involves causing injury or death, they are allowed by most states, if not required, to disclose the information. If you are facing charges, don’t hesitate to ask a potential criminal defense attorney about when client-attorney privilege begins. It is always better to be safe. When you need legal advice from an experienced and knowledgeable attorney, contact the team at Donahue Law Firm. Our defense attorneys are aggressive, understand how the court system works, and knows what it takes to be successful. When you work with us, you put your full trust and confidence in us.